Description: Newly updated interior with tons of space. The large kitchen features stainless steel appliances plus a full 2nd kitchen on the upper level also boasting new stainless steel appliances. The main level has 4 bedrooms and 1 1/2 bathrooms and the upper level has another possible 4 bedrooms or bonus space PLUS the full kitchen! 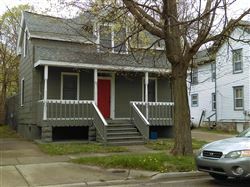 Walking distance to bus line, WMU and Kalamazoo College. New paint and flooring inside and out. New appliances. Both on and off street parking available. Tenant is responsible for utilities.